When Farragut Naval Training Station was built near Bayview, Idaho in the 1940's, the soldiers were not the only new arrival. Idaho gained it's first submarine fleet that is still active today. During the middle of the night the small scale, unmanned sub glides through the cold, dark waters of Idaho’s deepest lake, Lake Pend Oreille. Idaho? Yes, for over 65 years the south end of the lake has been the premier testing ground for acoustic development of the Navy’s submarines. Many rumors have been sparked by the activity at the Naval Acoustic Research Detachment (ARD). “They are doing secret maneuvers in the middle of the night.” “They have a full-sized nuclear submarine there.” And my favorite: “They stirred up the ‘Paddler’!” (The monster that lives at the bottom of the lake). The center was originally part of the Farragut Naval Training Station in 1942 just south of Bayview, Idaho. 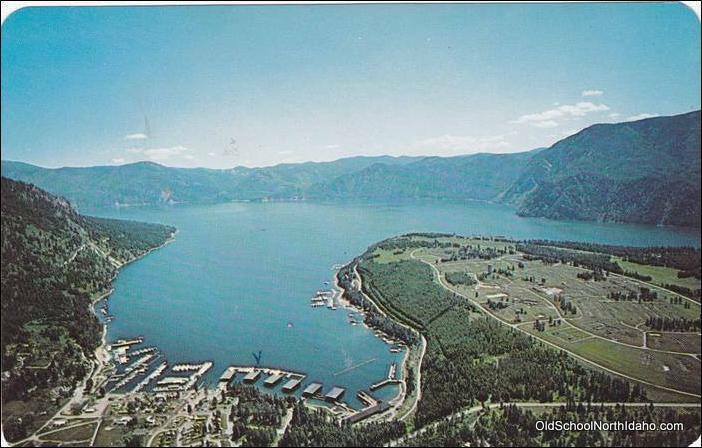 Soon after establishing the facility, the Navy found Lake Pend Oreille was the perfect testing area for acoustic related aspects of the submarines. The mission of the ARD is to help provide the Navy with a quiet running submarine at the least amount of money. Lake Pend Oreille is 1,150 ft deep near the southern end. There is also a 4 mile wide channel running up the center near that area. The lake is 46 miles long. The steep tree-lined shoreline; the constant chilly temperature at 100 ft (39 F); the flat, muddy bottom; and little boating activity during the night makes this lake the perfect testing ground for acoustic (sound) studies on the vessels. The center has a fleet of ¼ scale models: Dolly Varden, Kokanee, Pike, Whitefish, Steelhead. 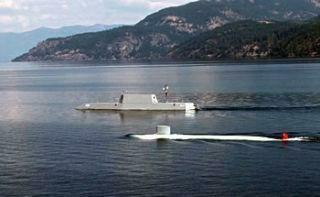 They also have two larger model subs: the Kokanee and the Cutthroat. These vessels are monitored during the tests by strategically placed hydrophones and recording devises on the lake bottom and shoreline. The data is gathered, analyzed and adjustments made where needed on the vessels. New concepts and ideas are tested here before being added to the fleet vessels. The ARD has been an important part of the community of Bayview for many years. 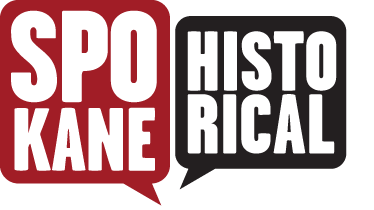 The mystery that surrounds the activities of the center adds to the local folklore and history. When you venture to the shores of Lake Pend Oreille near the southern end under the cover of dark to watch the “submarine races”, that may be literally what you see. Model submarines in Scenic Bay of Lake Pend Oreille: Normally the model subs are run during the night when the lake is quiet which aides in the testing of the acoustic ability of the subs. The steep, tree-lined banks surrounding the bay also aid in reducing noise. Courtesy of Keva Wolfe. The south end of Lake Pend Oreille and Scenic Bay. : Scenic Bay, Lake Pend Oreille. This area is the deepest part of Lake Pend Oreille reaching a depth of over 1,000 ft. Much of the shoreline is uninhabited. The field to the right of the picture is part of Farragut State Park where the Farragut Naval Training Base hospital was located. Courtesy of Old School North Idaho. The Cutthroat model submarine. : The Large Scale Vehicle (LSV-2) Cutthroat. This submarine is a 110 ft long, Virginia class vessel that was named by elementary student at the Athol school near Bayview. It is the largest unmanned sub at the facility. Parts of the hull can be replaced to allow for different tests. It can run on auto pilot. Courtesy of Keva Wolfe. The Sea Jet surface vessel. : The Sea Jet. This sub-scale surface vessel was added to the fleet in 2005. 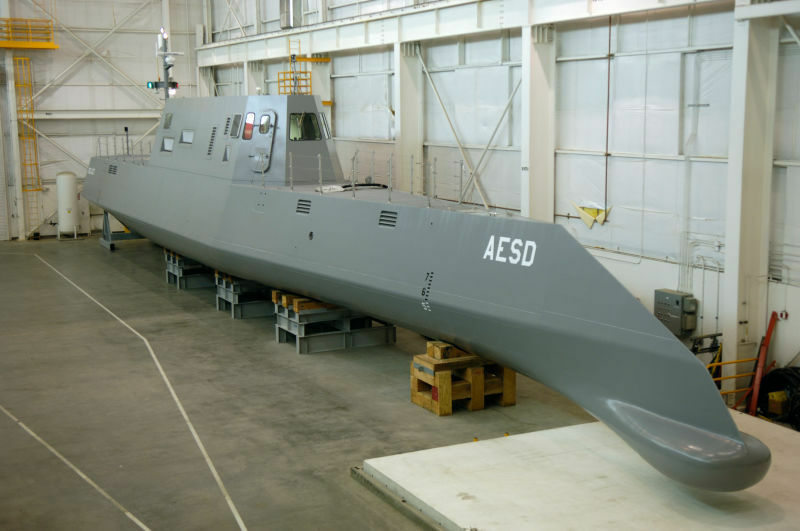 The Advanced Electric Ship Demonstrator (AESD) is a Zumwalt class destroyer with a unique tumblehome hull. Courtesy of Keva Wolfe. Navy test barge in the middle of Scenic Bay on Lake Pend Oreille. : One of the barges used by the Acoustic Research Development teams during the testing phase of the model submarines. The barge has complete computer data systems to track the test results and send the information back to the main computer. Cranes on the barge help to raise and release the subs for the testing runs. Courtesy of Keva Wolfe. Mary Garrison, “Idaho's Submarine Fleet,” Spokane Historical, accessed April 20, 2019, https://spokanehistorical.org/items/show/589. From the Bayview Historical Society, “Naval Acoustic Research Detachment (ARD),” available at http://www.bayviewhs.com/naval-acoustic-research-detactment/. Rogoway, Tyler. 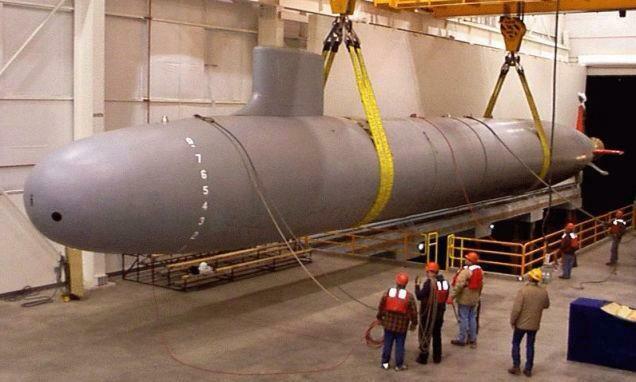 “The Navy’s Most Vital and Secretive Submarine Base is in . . .Idaho?! ?,” Foxtrot Alpha (June 2014).